Northern Va. Tries New Model To Battle Sprawl Over the next 30 years, Fairfax County in Virginia is planning a makeover for Tysons Corner, one of the biggest concentrations of retail, office and hotels in the suburbs in the country. The changes — to make it a more walkable city — could create a model for similar places across the country. Tysons Corner in Northern Virginia is one of the biggest concentrations of retail, office and hotels in the suburbs in the country — and it's slated for an extreme makeover. 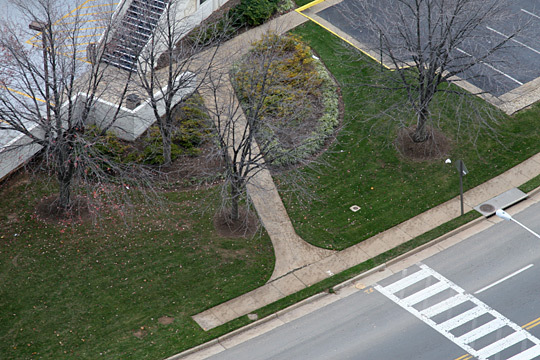 At Tysons Corner, sidewalks inexplicably end, creating a hostile environment for pedestrians. 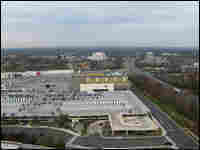 Tysons 7, on the west end of Tysons Corner, is a small section of the sprawling suburban mall. 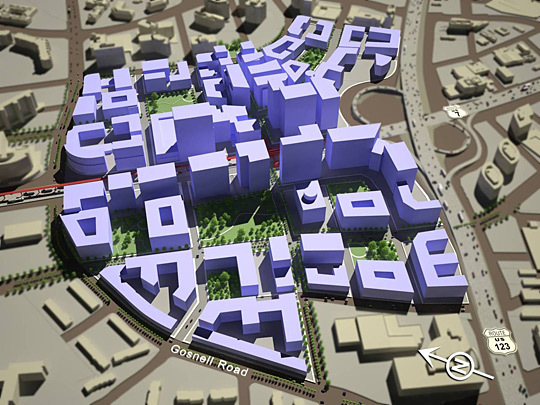 Below is an image of how the area currently looks — and what the urban planners have visualized for redevelopment. How Tysons 7 looks now. How Tysons 7 could look in the future. Tysons Corner, a sprawling suburban area anchored by two regional malls in Northern Virginia, is slated for an extreme makeover. 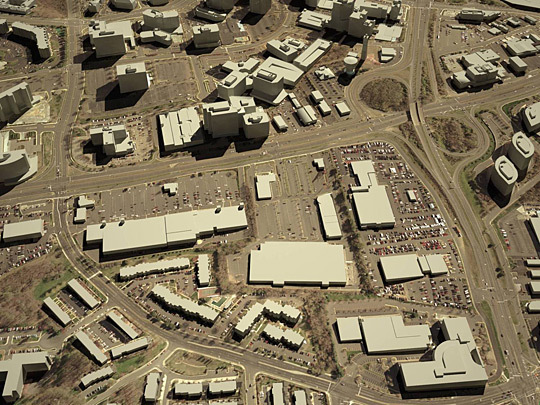 Over the next 30 years, Fairfax County is planning to build a real city out of an "edge city," or what people used to call places that cropped up in the outer suburbs to shop or work, but not to live. Tysons will get a real alternative to driving when the Washington, D.C., metro rail system comes to the area in a few years. With the makeover, Tysons could be a model for change across the country. 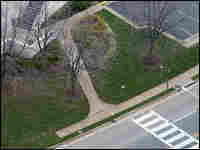 "This is your classic drivable suburban place that is anchored by a regional mall, just like Perimeter Center in Atlanta; King of Prussia, outside Philadelphia; Schaumberg, west of Chicago; Newport Beach; and Costa Mesa south of Los Angeles," says Chris Leinberger, a developer turned academic and urbanist who is now at the Brookings Institution. "This is, however, one of the biggest, if not the biggest concentration of retail, office and hotels in the suburbs, in the country." Started on farmland in the 1960s, Tysons is a city for cars with two huge shopping malls, tens of thousands of shoppers a day and 167,000 parking spaces. The streets are broad — and what should be right angles at the corners of intersections are curved turning lanes so drivers don't have to slow down. 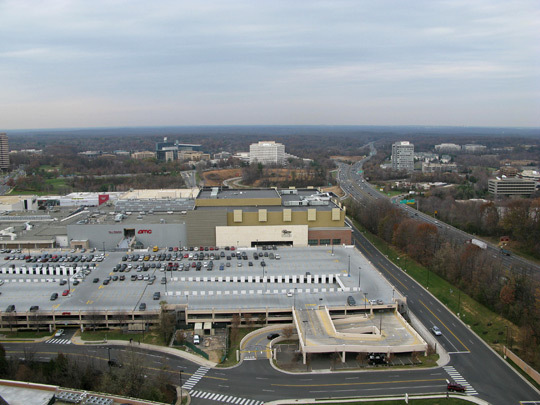 Tysons was built 13 miles from Washington, D.C., near two interstate highways and half way to Dulles International Airport. But as D.C. sprawled, the edge pushed out 30 miles and now Tysons Corner is what's called in real estate terms an "infill," Leinberger says. The car-dominated city is the product of policies and subsidies that favored drivable suburban development, he says. "This is something that we the people wanted very badly," he says. "What we didn't know is as you build more of it, you decrease the quality of life." Fairfax County is the most populous county in Virginia — and Tysons Corner is a huge source of its revenue. But in today's market, people want walkable, bikable, livable, urban environments. That will be possible as Metro rail makes its way from D.C. to the airport. Four Metro rail stations are planned to anchor four of five new neighborhoods in Tysons. Bill Lecos, who runs the Fairfax Chamber of Commerce, admits that Tysons was designed for cars, not people. 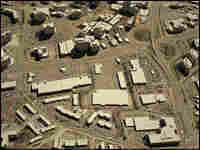 "About 17,000 live here and about 117,000 — give or take — come to work here every day," Lecos says. "So that incredible imbalance is why you have the absolute commuter nightmare of trying to get 117,000 people in, in one period of time in the morning, and out again at 5 o'clock." 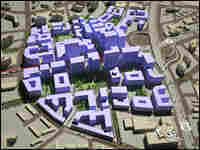 So, a central part of the plan is to build residential housing, and plan for 100,000 people. But that means more than build apartment houses — Tysons is also utterly inhospitable to pedestrians. Clark Tyler, who chairs the Tysons Corner Land Use Task Force, says there are nine lanes of traffic near Tysons Corner Center, but the street lights give pedestrians only 40 seconds to cross them. Sidewalks mysteriously end. Although developers are starting to love the idea of green, dense, walkable neighborhoods because the land value will rise, some of Tysons' neighbors are incredulous. "I'm so used to Tysons being what it is now that it's a new idea that we've got to get our minds wrapped around," says Mayor Jane Seeman of the neighboring town of Vienna. "And it's a little difficult, but you've gotta think far enough ahead in the future, I guess, to believe it." She and a coalition of neighboring residents want to have a voice in the continuing development. So, what will the new Tysons be like? "Hopefully it will have sidewalks that aren't hyphenated," Tyler says. "It will have a grid of streets, shorter blocks, it will have a circulation system, so the other thing that would be radical is what they call LEED certified — or green buildings that are energy efficient — and all the rest because that's what we've recommended." Buses to get you from the rail stations to these stores — right now, that sounds like science fiction. It also sounds like a city. The 30-year plan for Tysons isn't like a plan to restore an old place: You can't peel away the clumsy construction of the 1970s and then work with the remains of a charming older city somewhere beneath. The place went from zero to 60 like a fast car. "This is going to be the model of how we transform King of Prussia, Perimeter Center, Costa Mesa down in Orange County, Calif.," Leinberger says. "All of these places are going to be transforming just as you are. But you're going first, which means that you get to pay the dumb tax."